In many ways, gaining weight is very similar to losing weight. Just like weight loss programs, a solid weight gain plan requires time, a balanced approach and commitment. To be successful and gain the weight you want you’ll need to be aware of the different types of calories and how they affect you, which foods you should be eating, how you should be exercising, and whether or not you should be taking a supplement to help you reach your goals. Once you are armed with all of the knowledge you need to know about how to gain weight, it’s just a matter of taking things one step at a time. When starting your weight gain journey, the first thing you need to do is identify the reason why you want to gain weight. Are you looking to get stronger or more muscular? Maybe you are just tired of looking skinny and getting snide comments from people about how “you need to eat more.” Or are you underweight and simply trying to become healthier? Once you identify your reason, make sure to write it down someplace that it will always be in front of you. This way you can remember what your goal is and re-motivate yourself as you continue on this new adventure. So now that you know your reason for gaining weight, where do you start? With food, of course! Or, more specifically, with the calories and nutrients you’ll get from your food. While gaining weight may feel difficult at times, understanding the process of it is actually pretty easy. To gain weight you just need to take in more calories than your body burns throughout the day. That’s it – simple, right? Okay, so we’ve just figured out how many calories you need to maintain your current weight but how many calories do you actually need to start seeing results? Start by calculating your TDEE once more and then add 500 calories to that number. Your new result should give you the amount of calories you need to consume to start gaining 1-2 pounds per week. If you want to be more aggressive in your progress then add another 500 calories to your total. This is the amount of calories you would need to consume to gain about 2-3 pounds per week. If after two weeks of consistently hitting these new calorie goals you still aren’t gaining weight, add an additional 500 calories and reassess in another two weeks. Do this until you’re gaining two pounds per week. If you don’t want to count your calories throughout the day, an easy way to meet your calorie goals is to plan your meals ahead of time. For a weight gain diet, carbohydrates will be the bread and butter (no pun intended) of your meals. Carbs contain four calories per gram and are the least filling type of nutrient which means you can consume more of them before your brain recognizes you are full and tells you to stop eating. When planning out your day, try to include a large amount of carbohydrates during each meal. Carbs can be further divided into two different types: simple and complex. Simple carbohydrates, also known as “sugars,” are often seen as less healthy but more appealing than their complex counterparts. This is because most simple sugars have no additional nutritional value beyond their calorie count, hence why people refer to them as “empty calories.” Sugars come from sources such as fructose (fruit sugar), lactose (milk sugar), and sucrose (table sugar). Many processed foods also contain sugars to enhance their sweetness. While these sugars should not serve as the basis of your entire diet, they are an important component to a full weight gain program. Complex carbohydrates, also known as “starches,” are generally considered to be healthier since they are often found in whole grain foods and starchy vegetables. Starches consumed from these sources are a great and healthy way to pack in the calories nutritionally. Starches can also be found in foods made with refined grains such as white bread, cakes, many pastries and other food sources. Similar to simple sugars, the starches found in these refined foods have limited nutritional value and should not be the foundation for your diet but can still be a big source of calories. Try to find a good balance in your diet between calories found in simple carbs and refined foods and the calories found in starchy complex carbohydrates. Fats are another macronutrient and are the most concentrated source of calories, providing nine calories per gram of fat. 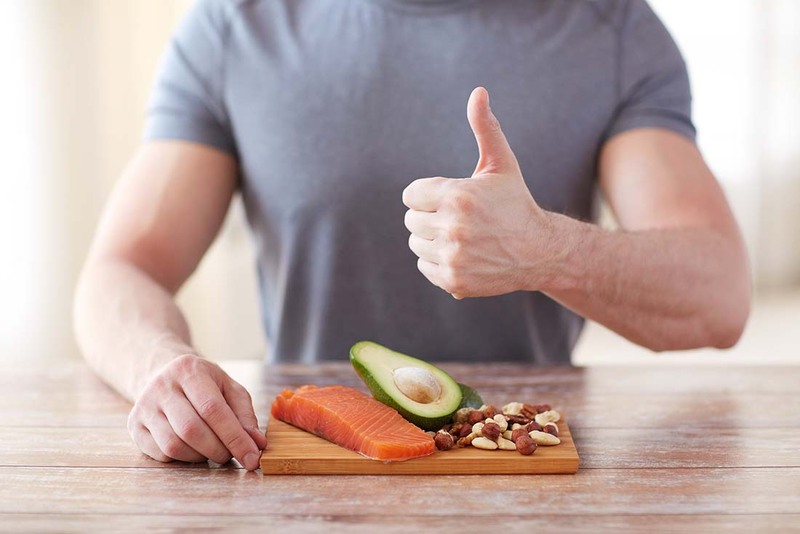 Fats are an often misunderstood nutrient; many people think that “fats are bad” or that eating fat means you’ll get fat, but that’s not the case. Fats are an important staple of any diet, especially a weight gain one. Avoiding fat completely can actually put you at risk of negative health effects (like suppressed testosterone production). Don’t be afraid of fat! Similar to carbohydrates, fats can also be broken down into two groups: saturated and unsaturated. Saturated (and Trans fats) are often considered “unhealthy fats” when eaten in excess. This is because a diet consisting of a high saturated fat concentration over a long period of time could have negative effects on cholesterol and a potentially increased risk of heart disease. Unsaturated fats are considered “healthy fats” and they provide the opposite effect, protecting the heart and preventing disease. If you are worried about your cholesterol levels, try keeping your saturated fats down to 20 grams or less per day. However in the short-term, an unrestricted diet of both saturated and unsaturated fats will allow you to really get the most calories out of your food and help you gain weight fast. The final macronutrient is protein which comes in at four calories per gram. Protein is used by the body for building, maintaining, and repairing itself which makes it an essential part of the recovery process. If fats are the most commonly misunderstood type of calorie, proteins are the most commonly misrepresented. Many weight gain programs put their main focus primarily on protein while giving only limited attention to fats and carbs, ignoring calories altogether. If you’ve ever tried one of these programs before, chances are that you didn’t gain the weight you wanted. While protein is still an important part of a balanced diet, proteins are the most filling type of calorie and they digest relatively slowly. A diet that consists primarily of protein is actually more likely to cause you to lose weight since you won’t have the appetite to eat the rest of the calories you need to exceed your TDEE. Your normal daily diet probably already contains enough protein but if you’re worried that you aren’t getting enough, shoot for around 50-60 grams per day. Potatoes – Mash them, bake them, grill them, fry them…so many choices! Rice – Cheap, easy to make, and able to be consumed in generous portions. Breads – Great for sandwiches or all alone. Don’t forget to add jams or butter for extra calories. Pasta – Spaghetti, lasagna, fettuccini, you can’t go wrong here! Fruits – Easy to eat on-the-go. Grab some apples, bananas, or berries. Vegetables – Soybeans, lima/kidney beans, and corn (on or off the cob) are all solid options. Nuts – Macadamia, pecans, and Brazil nuts are some of the highest calorie choices. Eggs – How do you take yours? Over easy or scrambled? Maybe hardboiled? It’s your call! Avocado/Guacamole – You can add it to just about anything and everything. Butter – Is there anything you can’t use butter for? Cheese – Parmesan comes in at 122 calories per ounce, but there are plenty of others to choose from too. Oils – Coconut, corn, olive, and canola, just to name a few. Chicken – With a seemingly infinite amount of ways to prepare it and eat it, chicken is always on the menu. Fish – Cod, salmon, tuna, etc. Beef – Choose from fattier cuts like rib eye and T-bone to get some calories from both protein and fat. Pork – Everyone loves bacon! But some other choices include sausage, ribs, or even chops. Whey – You’ll probably get enough protein in your normal diet without the need to add a protein concentrate but if you need the boost, whey protein is one of the more affordable options. Many high calorie food sources come in liquid form, making them portable and easy to consume. Make sure to take advantage of these easy calories with every meal. Whole Milk – Soy milk is a good alternative if you are lactose intolerant. Fruit Juices – Apple, Orange, and Berry juices. Smoothies – Fruit smoothies are both tasty and refreshing! Coffees – Black coffee doesn’t contain much in the way of calories so if you need a caffeine boost in your day, try sticking to Mochas or Lattes. Otherwise try adding cream and sugar to give your caffeine a little calorie boost! Soda – A high concentration of refined sugar makes this a less healthy choice but the occasional soda can provide a quick calorie bump. Most of your calories will come from your meals and drinks but don’t underestimate the value of snacking! Always have high-calorie snacks on hand so that you have something to munch on throughout your day those extra calories can really make a difference. Candy/Sweets – Just like soda, these sugary foods should be taken in moderation but can provide a high amount of calories per serving. Working Out – To Bulk or Not to Bulk? Remember how earlier we talked about how an active lifestyle generally has a higher Total Daily Energy Expenditure than a more sedentary one? The more you exercise the more calories you will burn and the higher your TDEE will be, ultimately raising the amount of calories you need to consume for weight gain. When you’re first learning how to gain weight, it can feel like exercise actually makes things harder. But the truth is that it’s the type of exercises you do that will make all the difference. With the proper workout routine you can target specific areas of your body for weight gain without burning too many calories off. First, avoid any intense aerobic/cardio exercises. If you enjoy going for a morning run every day, try going for a shorter walk instead. These cardio exercises burn off a ton of calories without helping to add much in the way of body mass, so they aren’t ideal for helping you gain weight. Instead, focus more on resistance and strength training which involves lifting weights or doing exercises with specific body parts. This will help develop the muscles in those body parts and show your body that this is where you want the weight to go. Some examples of resistance exercises could include deadlifts, rows, bench presses, shoulder presses, and leg presses. Keep in mind that too much exercise will burn off the extra calories you’ve been storing from your meals and make it harder to gain weight, so you don’t have to hit the gym every day to see results. In fact, you don’t have to hit the gym at all! There are plenty of resistance exercises you can do from home to help gain weight such as push-ups, pull-ups, squats, and lunges. Try to set aside at least a half hour 4-5 times each week for doing some resistance exercises. If you are using weights for your exercises, use heavy weights with fewer reps and long rests between sets. Keeping your heart rate down will limit the amount of calories you burn during your workout. Oh and ladies, remember that working out isn’t just for the guys! Women that use resistance training on a weight gain program develop more shapely hips, a curvier chest, and a bigger booty. Let’s face it: gaining weight can be a challenge and everybody needs a little help from time to time. Sometimes you can do everything right like planning your meals and choosing the right foods but when you sit down to eat you find that you just aren’t hungry. Or maybe you consistently meet your calorie goals every day but after a few weeks you find that you’re still not gaining weight. If you feel like you’ve hit a wall and just can’t make those gains, taking a weight gainer supplement can help give you the edge you need. Protein Shakes – Protein shakes are one of the most commonly available supplements on the market which makes them easily accessible. However, finding the right type of shake can be difficult. Since too much protein can actually curb your appetite and make you lose weight, you’ll want to find a shake with an optimized amount of protein so you can get the highest amount of calories without feeling full. Creatine – Creatine is one of the most popular supplements for gym-goers and bodybuilders, making it another relatively cheap option for gaining weight. Creatine works to give you more energy and make you feel stronger so that you can lift heavier weights during your workouts. Creatine is a good choice if you plan on hitting weights regularly but if your weight gain program involves at-home exercises or only limited workout time, it may not be the best option for you. Multi-vitamins – While multi-vitamins may not help you gain weight directly, they are a fantastic source of many vitamins and minerals your body needs for building the body you desire. For example, zinc and iron deficiencies are some of the leading causes for a weak appetite. A lack of vitamin B-12 can also result in a lowered appetite and decreased energy levels. Most multi-vitamins on the market are designed for general health and not weight gain though, so finding a multi-vitamin with all the nutrients you need to gain weight can be difficult. Do your research to find a multi-vitamin that fits your needs. Appetite Stimulant – If your biggest obstacle is finding the appetite to eat enough food, an appetite stimulant can help give you the kick you need to pack in enough calories each day. A few appetite stimulants, such as CB-1 Weight Gainer, will even slow down your metabolism naturally and safely so that you burn less calories throughout the day. CB-1 also comes in a pill form, making it both convenient and portable. Eat what you want. We always suggest eating well-balanced meals throughout the day to keep you healthy, but don’t be afraid of eating a bowl of ice cream for breakfast or having steak for both lunch and dinner if that’s what you enjoy. The more you look forward to your meals, the more you will eat. Eat frequently! Instead of only eating 2-3 large meals infrequently throughout the day, focus on eating around 5 smaller meals consistently. It might seem like a lot at first but as your body gets used to it you will start to feel hungry around those times and you’ll want to eat more. Eat before bed. Did you know that when you go to sleep your body enters a recovery phase and continues to burn the calories you ate during the daytime? If you didn’t manage to get enough calories in during the day your body might even burn off the excess calories you took in, leaving you back at square one the next day. Try eating one of your meals, or a large snack, right before bed. This gives your body an extra boost of protein and carbs that it can turn into weight while you are sleeping. Speaking of sleep, make sure to get a full nights’ rest! Sleeping is an essential part of your body’s recovery and building. When you are awake you are constantly on the move, so your body holds onto the calories you’ve consumed to use them for energy as needed. When you rest, your body recognizes that now is the time to take those extra calories and use them to create more body mass. Give your body the time it needs to create the new you – focus on getting a full 8 hours of sleep every night. Remember to be patient. Results don’t happen overnight. Whether you’re just putting on the pounds for beach season or for sports, maybe you lost weight because of an illness or injury, or perhaps you’ve wanted to gain weight your whole life…chances are you’ve been thinking about gaining weight for some time now. Don’t give up just because you aren’t seeing results within the first couple of days. Commit and give yourself time to achieve your goals! Utilize your plateware. A neat way to trick your mind is to put your food on the biggest plate you have. Even if it’s a hearty serving of food, seeing it on a huge plate makes your brain think that it really isn’t very much. It delays that feeling of fullness so that you can throw on a second or even third helping to really pack in the calories. Have the need for speed? It’s a commonly known fact that it takes about 20 minutes for your stomach to receive the signal from your brain telling it that it is full. For a weight gain diet, try to eat your meals quickly so that you can consume a larger amount of calories before your brain realizes you are full. If you’re eating at home, concentrate on eating your meal instead of watching TV or any other activities. When you get distracted it gives your brain a chance to catch up and generate that signal of fullness before you’ve had a chance to make the most out of your meal. Make it fun! Gaining weight shouldn’t be a chore or stress you out. There are so many delicious foods to enjoy in many different fun ways. Treat yourself to a night out of dinner and drinks with friends or family. Go to a local festival or fair and eat the fun foods that normally aren’t available to you. Go out to the movies and get a large popcorn to snack on. Trying to gain weight on a budget? Bring the fun to you! Invite guests over for a party and have them bring their own favorite party dishes for you all to share and enjoy. Want to learn more about how to gain weight? Check out the CB-1 Weight Gainer Blog for more great advice! Supragenix, LLC is a nutritional supplement company with a focus on providing reliable information on the proper use of nutrition and nutritional supplements to improve health and quality of life.